Review: Taiwan Tea Crafts … florals or flowers? I love Taiwan teas, especially the fragrant green oolongs (or pouchongs) and the relatively new rich black teas. So when TaiwanTeaCrafts.com — a tea exporter that, I am sorry to say, I had never before heard of — offered to send samples of some of their rather excellent teas, I wasn’t about to say no! Some folks enjoy darker, more roast-y oolongs, while others adore their aged oolongs, and you can find several varieties of each at TTC. Me, I like my oolongs as close to green as possible, so that is what they sent to me. Because they are so green, the teas have to be really fresh to show off their best qualities. As I opened the package of each sample from TTC I took a deep sniff … and let me tell you, these teas were so fresh they could have jumped up and kissed me on the cheek. And finally as a fragrant residue on cup, teapot, aroma cup, or the back of a spoon after the tea has been poured from it. 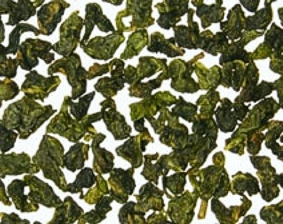 The first tea I sampled was the Baguashan Jade Oolong (Ciu Yu), lot #150. This was everything I love in oolongs: an enchanting, enveloping floral aroma echoed in the cup, lasting through six infusions, and the leaves with a beautiful rolled appearance with just enough stem attached. Curiously, the slightly pricier organic Jade Oolong (lot #131) was a far paler version … at least to my taste. If you have to choose one, go for the #150. Now let me explain what I mean by “floral” versus “flowery” teas. A floral tea exudes the sweet, intense perfume of flowers from the first moment your nose, and then your palate, meet them, and continue to do so. The best floral teas permeate the room/s where you’re preparing and sipping them. This jade oolong #150 did exactly that and then some with a beautiful melange of spring fragrances: lilacs, carnations, apple blossoms all rolled into one. And flowery teas? Well, that will be in my next posting! What a pleasant surprise to read your review this morning, thank you ! First of all, both teas you reviewed come from the same producer, therefore the same terroir, and, as you pointed out, are made from the same varietal, in this case: Cui Yu TRES-13. 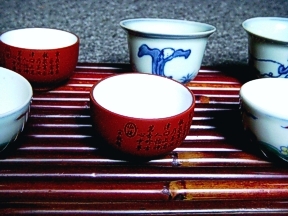 The differences lie in essence with the picking season from which both teas were produced. Lot 131 is a Fall tea whereas Lot 150 is a Winter tea. It is common knowledge here in Taiwan that Winter teas have better aromatics. I hesitate to say they are the best since I don’t like being categoric, but if you ask any Taiwanese which seasonal crop they prefer to buy they will most likely say Winter ! (yes, Winter more than Spring …). The rule of thumb is to consider cooler seasons as opposed to hotter seasons for low oxidized teas since these are less tannic leaving the aromatic components to not be veiled as much by harsher notes. But, this being said, a good experienced producer, as it is the case here, can balance out this aspect by tweaking his finishing steps to compensate. The finishing of oolong teas are critical steps in defining the resulting taste and aromas and sealing them in the leaf for good shelf life. Finishing involves different ways of baking/roasting/firing the leaves that are most often learned from experience and remain the trade secret of the maker. Some of you may also point out that one tea is organically produced as opposed to the other one. Does that have a bearing on taste, you may ask? A reasonable answer would lead me to say that it is quite a complex issue that requires more that a few lines to explore. That would be a good subject for a future Tea Guide article (?…). I hope that above will interest your readers and I look forward to reading your following reviews. All the best to you and your readers ! Thank you for taking the time to make these clarifications, Philip!